A necessary condition for reaching sustainability, responsibility, and ethics (SRE) in a business context and personally, is to create a distinct set of managerial competencies. The four-hour seminar Practicing sustainability, responsibility & ethics at the Management Center Innsbruck, was aimed to help students develop a basic set of such competencies across the domains of Knowing, Thinking, Acting, Interacting, Being and Becoming. 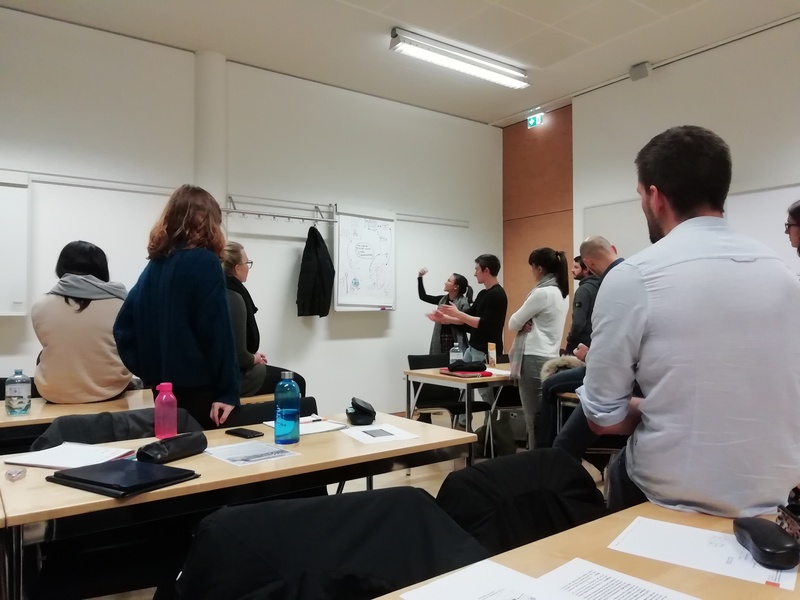 The seminar was delivered by Oliver Laasch from the Center for Responsible Management Education upon invitation by the Management Center Innsbruck (MCI), a leading signatory to the UN Principles for Responsible Management Education in the DACH region. WHY SHOULD A BUSY STUDENT OR MANAGER SPEND TIME ON THIS TOPIC? As a student, you are aiming to make decisions, whatever kind of career you are currently planning and as a manager, you are already making decisions on a daily basis. But deciding carefully takes more than just an easy thought of maximizing profits and the value of stocks. It is in your hands to take action now and change the future step by step – If you know how. The first part of the seminar started with presenting ourselves, the reasons for attending at the course and discussing our current knowledge and opinion on Responsible Management. We deepened that knowledge with an introduction to the theories of Responsible Management and got experts to a certain extent. The second part was group work. Three different groups had to draw a big picture, thinking of a given subject. This type of task is called the rich picture method. We had to reflect topics such as “companies that recruit the only student from top universities”, or “leaving the fridge doors open in supermarkets”. Once the drawings were done, each group read through the drawings of another group’s work and try to interpret it. During this whole process, we tried to change the perspective on Responsible Management as often as possible to get a full understanding of a certain issue. Therefore, it was interesting to see how our ideas evolved around specific topics. The purpose of the third part was to engage people outside the university in a conversation about aspects of sustainability and ethics. In order to do so, we went outside and asked people or business owners about a specific ethical subject. Most of us focused on the restaurant owners; together we discussed the waste of food and how they manage it. Finally, we compared the answers we got back in class. We all found that it is difficult to start a conversation about such topics with business owner’s since they do not want to admit a possible wrong behavior. Moreover, they may have felt being put under pressure and thus may did not answer completely honestly. Therefore, we developed alternatives on how to initiate a discussion about matters of ethics and sustainability.